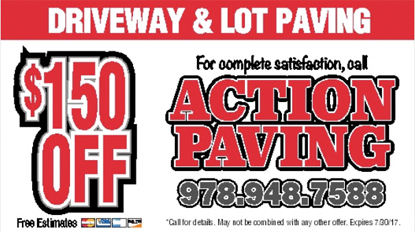 Action Paving has provided Rowley, MA, the North Shore and the Greater Boston Area with high quality paving services from residential home-owner's driveways to commercial business parking lots. No matter what phase of the paving process you may be at, we can handle it all; paving, seal coating and striping. Action Paving prides itself on offering friendly and reliable service with the highest level of craftsmanship, customer service and our attention to detail. No matter what the job size our experienced technicians can handle it!